We try here at Kumulos, but sometimes it’s hard to be humble. 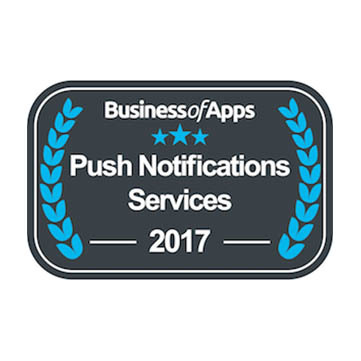 That’s because we’ve been named as one of 2017 Top Push Providers by the Business of Apps website. It’s pretty cool to see Kumulos ranked up there with some of the biggest names in the industry (including one called Amazon that you might have heard of). This follows Kumulos being named as one of the Best Push Notification Services by Appsee and voted as the Best Push Notification Service by users over at the Softonic website. But it just goes to show that Kumulos is respected by both our users and some of the leading sources in the app industry. With all that going for us, you might think it would be easy for us to sit back and rest on our laurels. But come on – you know we’re not like that around here! In 2017, we brought you crash reporting, analytics, geofencing, improvements to our push notification platform, and the Kumulos Approved Partner Program. But we couldn’t have done it without you – our customers. So we wanted to give a big shout out to you as well and wish everyone Happy Holidays. And just wait until you see what we have planned for 2018! App Promotion Summit London – Kumulos will see you there!